Globally February 2018 was the sixth warmest February since reliable measurements began in 1880, 0.78°C warmer than the 1951-1980 mean. February temperature was +1.06°C relative to the 1880-1920 base period that provides our best estimate of pre-industrial global temperature. February temperatures relative to 1951-1980 mean, in order from the warmest, were +1.34°C (2016), +1.12°C (2017), +0.90°C (1998), +0.87°C (2015) and +0.79°C (2010). A comparison of the monthly mean temperatures for 2015-2018 is shown in the figure above. 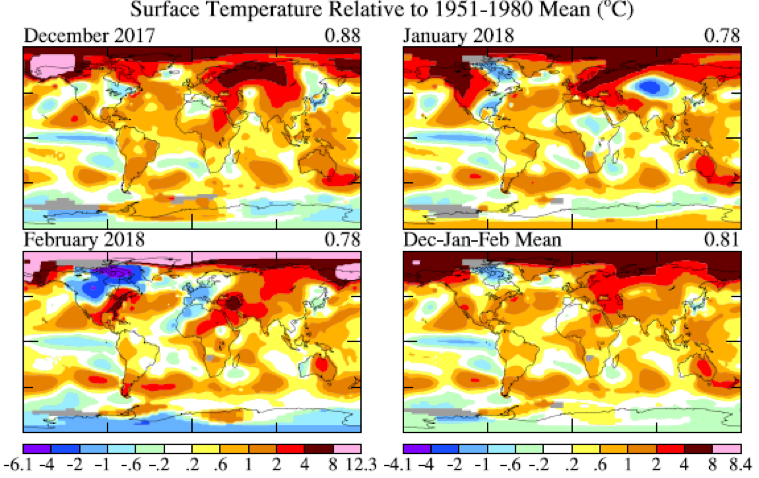 As one of the maps above shows, February was cold in Western Europe and Japan, but a large region from Canada to the northern central US was 4-6°C colder than the 1951-1980 mean, while the Arctic region was 8-12°C warmer than normal. Such cold air outbreaks from the Arctic to middle latitudes, with accompanying movement of warm mid-latitude air into the Arctic, have always occurred because of natural variability of atmospheric wind patterns. However, there is evidence (Cohen et al., 2018) that the frequency of winter cold air outbreaks from the Arctic has increased as a result of global warming. Average warming is greater in the Arctic than at lower latitudes, in part because global warming reduces the area of Arctic sea ice, which amplifies the polar warming. The greater polar warming reduces the temperature gradient between low and high latitudes that drives the mid-latitude jet stream, the west-to-east wind in the upper troposphere. A weaker jet stream tends to be more “waggly,” increasing the occurrence of Arctic cold air outbreaks. The situation is different in the Antarctic. The surface of the Southern Ocean is warming more slowly than most of the planet, in part because of the cooling and freshening effects of increasing ice discharge from Antarctic ice shelves (Hansen et al., 2016). This cooling effect on the surface of the Southern Ocean competes regionally with the warming effect of increasing greenhouse gases. There is large year-to-year variability; the strong 2016-17 El Nino caused a decrease of Southern Ocean sea ice over the past two years. However, if melting of Antarctic ice shelves and ice sheets continues to increase, the warming of the Southern Ocean will continue to be much less than warming in the rest of the world. Cohen, J., K. Pfeiffer and J.A. Francis, Warm Arctic episodes linked with increased frequency of extreme weather in the United States, Nature Comm., publ. online 13 March 2018. Hansen, J., M. Sato, P. Hearrty, R. Ruedy, M. Kelley, V. Masson-Delmotte, G. Russell, G. Tselioudis, J. Cao, E. Rignot, I. Velicogna, B. Tormey, B. Donovan, E. Kandiano, K. von Schuckmann, P. Kharecha, A.N. Legrande, M. Bauer, and K. Lo, Ice melt, sea level rise and superstorms: evidence from paleoclimate data, climate modeling, and modern observations that 2°C global warming could be dangerous, Atmos. Chen. Phys., 16, 1-52, 2016.